Michael and Anna Olson helped me get ready for my New Year's Eve entertaining this week. 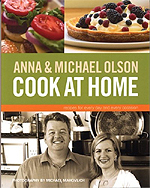 They have a new cookbook, Anna and Michael Olson Cook At Home. Try it out! Looking for the perfect gift of words you can eat? This week I feature my cookbook and culinary literature gift suggestions for Christmas 2005. This week it's the 2005 edition of my gadget and appliance recommendations for the holiday season. As always, I was assisted by my gadget guru, Fontaine Wong of Ming Wo Cookware on East Pender Street in Vancouver's Chinatown. Bartender Chris Stearns provided some holiday cocktail advice this week. I also talked about a new vanilla-flavoured cognac called Navan. You can find more info and recipes at www.navanworld.com. My favourite way of using Navan is 1 1/2 ounces Navan shaken over ice with the juice of one Mandarin orange and the juice of half a lime. One thing all these recipes have in common: Angostura bitters. One bottle costs about $5-6 at any supermarket in the drink mixes section. No kitchen should be without a bottle!